Serendipity means the gift of finding valuable or agreeable things not looked for. When I received the Dark Brown version of Marlondo Leather’s new Backpack two days prior to a camping trip in Montana, I understood what it meant to be a beneficiary of the concept. If you’ve never been excited about owning a backpack before, you will be when you see this one. It is gorgeous in its full-grain leather, brass rivets, and nickel-plated hardware construction. Equally at home in the office or on the trail, the craftsmanship and durability of this pack will serve you for years to come. Marlondo Leather spent a significant amount of time re-designing this pack from the previous version (read their no longer produced Rucksack review here), and the thought that went into it shows. They managed to combine beauty and functionality into a design that yields the perfect day pack for the adventurer, traveler, or full-time student. “Ma”, as he is known, is a Chinese entrepreneur who has worked to give the Marlondo name the meaning it has today. He turned early setbacks into a thriving online leather store that ships all of its products from US distributors and understands the importance of good customer service. The Marlondo Backpack is a heavy, beautiful beast constructed of full-grain cowhide leather, sourced from the United States, weighing in at 3 pounds, 10 ounces. Leather thickness varies from 2 to 3 millimeters (6-8 ounces) depending on the part of the bag measured. It is stitched with marine grade thread that can withstand exposure to sun, salt, chemicals and more without degrading. The designers saw fit to use heavy duty nickel-plated hardware for the buckles to ensure worry-free closure of the outside and main pockets. The D-rings on the outer flap of the main pocket, designed to be used with the optional utility straps – available in 3 different lengths – for holding a blanket, sweater, or similar item, are just as solid in their design. In addition to the aforementioned hardware, brass rivets at all stress points ensure you will probably wear out before this pack does. There is an outer pocket held closed by two buckled straps, two open side pockets, and an unlined main inner pocket featuring a two-pen holder (a neat idea, since I always tend to lose pens when the holders have been on the outside of the bag). The main chamber also sports a recessed pocket big enough to hold a 7” tablet. There is also a carrying handle, and two adjustable shoulder buckle-style shoulder straps. Overall, it is a tough, heavy bag designed to take the stresses of the road. It’s less likely you’d want to take it on long hiking trips due to the extra weight the leather adds. I’ve carried this pack for three weeks in the mountains of Montana and the concrete jungle of Spokane, Washington. In every case, I’ve carried the pack for a mile or less at one time. The pack never felt uncomfortable or too heavy, even packed up with 25 pounds. There’s room for water bottles on the outside pockets, and the front pocket serves for carrying a phone and other odds and ends. The main pocket has buckles on the sides that allow you to expand or contract the opening. By loosening these buckles, I was able to fit my 17-inch laptop inside and then cinch them back up for a snug fit. With no padding in the main chamber, you will want to be a little more cautious about dropping the pack on the floor after a day at the office. Even after putting in the laptop, there is still room for accessories and your schoolbooks. It also sports an inset pocket that held my 7” tablet and case with room to spare. I was still able to access the penholder on the inside of the main pocket, but it becomes somewhat less useful when the main chamber is filled with other items. In regards to the closure systems on this pack, everything is secured by buckles. These buckles do make getting into and out of the pack slower than other pack closure systems such as a drawstring or quick release plastic clips. Some might see it as a criticism of the pack, while others will appreciate the quality and craftsmanship that went into building the pack this way. In this case, it depends on whether you value function over aesthetics. If you want a backpacker’s pack, you can find them everywhere. If you want a beautiful leather backpack that you can take to work and out to play for a day, look no further. The covetous looks of family members when I first brought this pack home were enough to tell me what I already knew: don’t let this pack out of your sight, because someone will steal it. Full grain leather has a tendency to scratch easily. I think the scratches add to the look and patina of the leather on the pack. However, it is possible to buff out the scratches with a good quality leather conditioner depending on your preference. I do recommend you use a good conditioner (Marlondo offers one on their site), as this pack is an investment. The nickel-plated buckles and D-rings give a nice contrast to the bag. The brass rivets look great as well. However, I’d consider using non-plated buckles and D-rings in the future to give an even look to the metals on the bag. For me it is a very minor issue, but one worth considering. In regards to the buckle and strap closure system on this pack, I love the charm and toughness they give to the pack. While I may miss the occasional phone call if I put my phone in the front pouch, I can live with that. Serving as an eye-catching day pack or traveler’s pack, the $398.00 retail price certainly isn’t cheap, but it is a good value. The Marlondo Leather Backpack, even with its beauty and functionality, is a significant investment in leather. If you choose to do so, you won’t be disappointed. If you are someone concerned with the amount of weight you put on your back (back-country hikers, for example), you might look towards a synthetic material pack weighing significantly less. If you are someone who needs quick access to your pack all the time, there are no plastic quick releases here. I’d also have a hard time putting the pack somewhere that I couldn’t see it at all times. Its look and quality unfortunately make it a great target for theft in this day and age. Other than those considerations, the aesthetic appeal, durability, and functionality of this pack make it an excellent choice for anyone who appreciates fine leather goods by artisans who care about the products they craft. While I do own other backpacks, they’ve been, ahem, temporarily set aside while I continue my study of this pack for the foreseeable future. 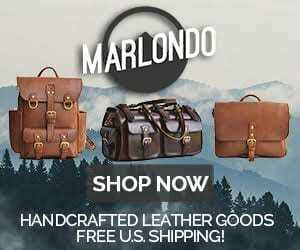 1 Comment on "Marlondo Leather Backpack Review – $398.00"